Harnessing the sun’s energy for power generation has been around for quite some time now. However, not many fully understand the full potential of how the sun’s abundant natural energy can help reduce the dependency on non-renewable sources of energy like fossil fuel. Two friends are all set to educate the world on this potential by making history via their autonomous boat, the Solar Voyager. The Solar Voyager is a solar powered boat that was launched in Massachusetts, U.S.A on June 1, 2016. The unmanned, autonomous boat has started an epic journey across the Atlantic Ocean using solar energy alone. The brainchild of Christopher Sam Soon and Isaac Penny, the Solar Voyager started as an ambitious project four years ago. Built out of standard motor parts and solar panels, the boat underwent several transformations from a rigged plastic kayak to an 18 feet boat featuring a custom made aluminum hull and a homemade and tested electronics and propulsion system. The Solar Voyager is fitted with a 280 W solar array that powers the boat. 2.4 kWh batteries located beneath the deck power the boat at night. A small Go-Pro has been fitted and programmed to take random photos and videos at regular intervals. A satellite enable tracking device along with a data transmission component allows the boat to follow a specific path between pre-determined GPS waypoints while allowing the team to regularly monitor its progress and operation remotely. Statistics like position, speed, battery level, local temperature and generated solar power, etc. will also be reported online automatically by the boat every 15 minutes. If all goes well, the Solar Voyager will take a total of four months to cross the Atlantic Ocean. It will arrive in Portugal by fall and circle the final GPS waypoint following which the boat will be retrieved by the team. The Solar Voyager may not be the first autonomous boat that crossed an entire ocean. 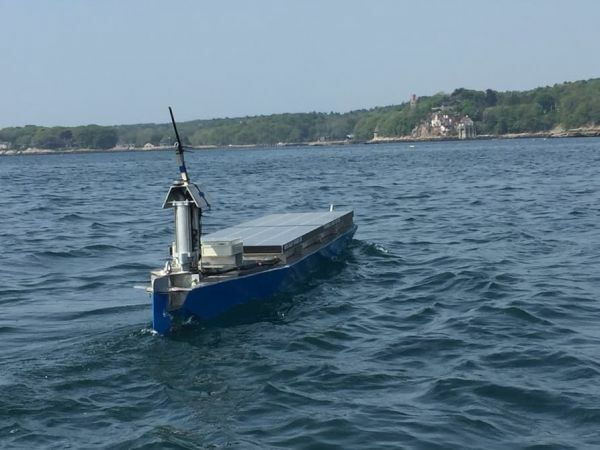 In fact, a joint collaboration between companies Liquid Robotics and Wave Gliders led to the creation of an autonomous boat back in 2012. However, while the boat used the energy harnessed from the waves for power, the Solar Voyager holds the distinction of being the first autonomous boat to cross an ocean solely on solar power. 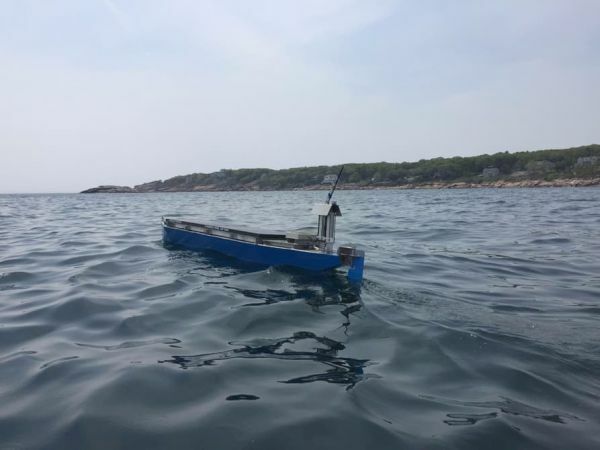 And unlike the previous team which set up a halfway point to service the boat, the Solar Voyager will be unmanned right from the start of its journey in Massachusetts to Portugal. Christopher Sam Soon and Isaac Penny reveal that their Solar Voyager still has a long way to go in terms of completing the journey across the Atlantic without any hurdles. These include the possibility of a motor break down or the onboard batteries getting damaged mid-way. Chances are also high that the boat may be mistaken for a fish by some hungry shark, or may run into an ocean liner although it has been programmed to avoid shipping lanes and has been painted with very visible colors. And then, there is the Herculean task of making it across the Atlantic without facing a storm that can force the boat to tackle 30 foot waves. Christopher Sam Soon and Isaac Penny reveal that more than the fame, the main reason for the Solar Voyager’s journey is to promote the use of solar power for transportation in the near future. The friends indicate that using solar power can help power things indefinitely, offering a suitable alternative to fossil fuels that not only come with limited life, but pollute the environment to a great extent. The Solar Voyager is a solar powered autonomous boat that has started an epic, unmanned journey across the Atlantic Ocean. The boat is all set to make history by being the first boat to cross an ocean on solar power alone while promoting the use of same for transportation purposes.